A small theater company moves into an abandoned Chicago storefront. Led by their adventurously thirsty artistic director, they embark on an explosive new play with the hope of finally breaking it big. When the ensemble realizes their source material might not be as original as once assumed, they are thrust into an intense confrontation with residents of their new community, who not only want them out, but will take their story back by any means necessary. Red Rex is the sixth play in Ike Holter's seven part "Rightlynd Saga," which also includes Exit Strategy, Prowess, and The Wolf at the End of the Block. "...For �Red Rex� is more a manifesto for systemic, socialist change than an industry take-down. It does not address as much as it could how these righteous changes should intersect with our existing capitalist system � for which it is hardly fair to blame storefront artists, who hardly are robber barons but mostly progressives doing the best with what tools they have been given. But then we�ll have to look at all seven plays to fully consider that. Fascinating that the climax comes next fall at, ahem, the Goodman." "...Everyone takes their licks: not just white artists and administrators but also artists of color, critics, donors, the Jeff Committee, everyone. But Holter knows how to shade his characters in; even the play�s closest thing to a true villain�Red Rex�s white, gay artistic director Greg (Chris Chmelik)�has his moments. The only parts of the play that ring false are the hopeful bits that Holter drops in towards the end, starting with a twist that immediately spins off its axis. By then, Red Rex has done such a convincing job of burning everything to the ground that salting the earth and walking away seem like the only correct course of action." 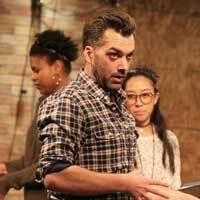 "...The latest installment in Ike Holter�s now six-play saga of the fictional Chicago neighborhood of Rightlynd is part social commentary, part inside-theater sendup. From all angles, it is smartly written � provocative, witty and taut." "...Buffeted by moments of tenderness (a conversation between a stage manager and a set designer finds Holter at his most effectively empathetic), �Red Rex� is dominated by cruelty. It has not one but two near-irredeemable villains, one who gets what�s coming, the other living with a ramrod running from spine to sphincter, which I suppose counts as its own kind of comeuppance." "...With the audience seated around the periphery of the room, every theatergoer will experience Ike Holter�s new play as if they were a fly on the wall. The drama is another of the playwright�s Chicago stories and part of a seven-part series. It�s story is gritty, unflinching and impossible to escape. The play will certainly entertain and haunt audiences, long after leaving the theatre. Thanks to the honest, realistic, multi-layered and fully committed choices of the cast, as well as Jonathan Berry�s perceptive direction and starkly realistic staging, it�s hard to imagine any other way to present this play." "...The Red Rex Theatre Co. rehearses a play about characters drawn from their own Rightlynd neighborhood in Ike Holter�s play at Steep Theatre. They hope this will be the play that will make their mark on the city, but that�s not to be. Because the story belongs to someone else." "...Desperate to give Red Rex the hit it needs to make the leap from obscurity to cultural relevance, playwright, producer, and director Lana (Amanda Powell) takes the loose outline of a decades-old Rightlynd family tragedy and dresses it up into a star-crossed, politically charged interracial romance. She has a cheerfully ruthless executive director (Chris Chmelik) slashing obstacles out of her way; a Jeff-winning, New York-bound set designer in Max; and a doggedly ethical and masterfully competent stage manager (Aurora Adachi-Winter giving new meaning to the phrase �slow burn�)."